Recently, I had the absolute pleasure of playing through Naughty Dog's magnum opus, Uncharted 2: Among Thieves. Critically acclaimed and well-received by the majority of PlayStation 3 owners, Among Thieves is one incredible game and deserves every accolade and ounce of praise it gets. This post isn't meant to be a review of the game, however. There will be no analysis or in-depth discussion of the game -- that will come later -- instead, this post is a simple overview of my thoughts on Uncharted 2: Among Thieves. The first thing I noticed while playing Uncharted 2 was the ubiquitous quality of the product. It's so good that it feels like Naughty Dog have thought of everything while developing the game. Of course, no game is perfect and when Uncharted 2 does show its flaws, it instantly breaks the immersion and jerks you out of the experience. With any other game, this would be a defining aspect of our impression and thoughts of it, to the point that it is absolutely plausible for a player to stop playing it -- not so with Uncharted 2. While it is sudden and obvious, it's seldom seen and within moments of having your immersion broken, the game has already drawn you back in, the slight hiccup a distant memory as you explore a new area, take out some enemies and advance the plot. This is aided by the enthralling attention to detail seen throughout the game. From the layout and inclusion of objects within the many environments Nathan Drake finds himself in, to the amazing texture work and draw distance -- it once again feels as if Naughty Dog have considered everything. Characters react to, comment on and engage with the events that take place; exposition on the story and its details can be found if you, as the player, choose to search for it; even simple combat is improved by the littlest touches. The best thing about this attention to detail and quality, though, is not that it exists in the game, but that it remains consistent throughout the entirety of it. Not many other games can lay claim to such a feat and for that alone Naughty Dog deserve to be commended. 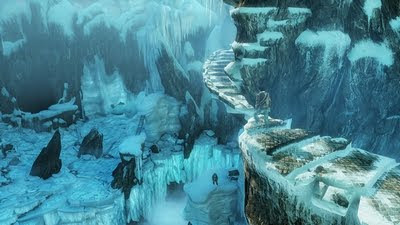 Wow, what a holiday Uncharted 2: Among Thieves is. Sounds ironic doesn't it? 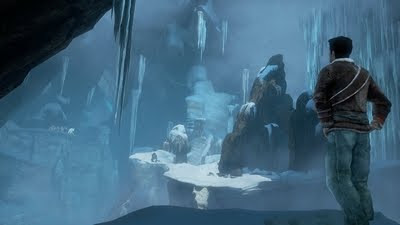 Drake and company find themselves in situations that are constantly intense, thrilling and unpredictable, but even so the locations visited throughout the game manage to be breathtaking in the same way that a trip to The Himalayas or Egypt might be. Despite being a linear adventure, these locations convey a reality that few other games manage, making Drake's presence feel foreign whilst revealing a culture, history and personality that begs to be explored. The insane pace with which the events of Uncharted 2 travels can mean it's hard to focus on these places at times, but the brilliance is that you will always have your chance. Naughty Dog were extremely clever about how they paced the game, but it's up to you to recognise when to stop, take a breath, and take it all in. If you don't, well, it is you who is missing out, no one else. If there was an element of the Uncharted franchise that I would pick as the reason anyone should play the series, it would be the story and its characters. I am so enamoured by Nathan, Elena, Victor and Chloe's story that I can't articulate -- yet, at least -- how awesome it is to be able to participate in, and be an audience to their story. Despite the insane situations they find themselves in, these characters are so compelling because they seem to be real. There's no overly dramatic stereotypes here; there's just a bunch of characters taking things one step at a time, reacting to and approaching everything if and when they have to. It's their improvisation that usually gets them out of their sticky situations, while the humourous banter and witty dialogue distractions are just the icing on the cake. They are archetypical whilst also being believable, and that's a breath of fresh air in an industry that is still defined by space marines, alien invasions and fantasy creatures. You might have noticed that despite the above praise, I didn't really speak about particular examples. There's two reasons for this: the first, easy one is that I do not want to spoil the game for potential readers who may not have had the chance to play it yet; the second is that I'm saving the in-depth examples for a future series of posts I will have on the game. Needless to say, Uncharted 2: Among Thieves was one hell of a thrill ride (literally) and one of the best gaming experiences I have had in recent years. It was a pleasant surprise, but then, Naughty Dog had already demonstrated with the original game just how talented they are, and just how awesome their new franchise is. With this in mind, I'd like to take the time to speak about the original game, Uncharted: Drake's Fortune, before I delve into my proper thoughts on its sequel. Look forward to my first post on the game next week.